Celtic bracelet features silver tone metal that is enhanced with 5 beads that include the shamrock and the Trinity. This silver tone metal Celtic bracelet features 3 metal beads and 2 resin beads with designs that include the Trinity and the shamrock. The 7 1/2" long snake chain has a Celtic knot closure catch and is made by Solvar Jewelry in Dublin, Ireland. The bead bracelet is gift boxed with the respective symbols' history card, complements of The Irish Gift House. Celtic bracelet features silver tone metal construction that includes two Trinity knot shape beads. Celtic bracelet features silver tone metal construction that includes spiral and the shamrock beads. Celtic bracelet is a silver tone metal design that includes a shamrock shape bead. 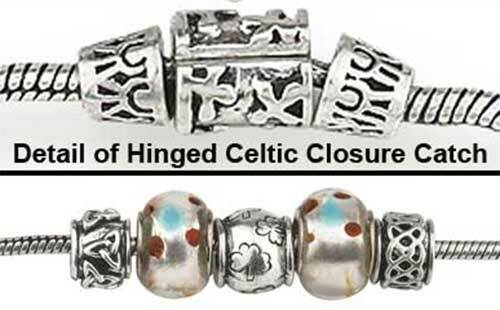 Celtic bracelet features silver tone metal construction along with knot-work beads that includes the Trinity. Celtic bracelet features silver tone metal construction that includes Trinity knot and Claddagh beads. Celtic bracelet features silver tone metal construction that is enhanced with beads that included the Trinity knot and the spiral.